I grew up around cycling, my father has been a long time Amateur and Enthusiastic rider, most of his friends were also cyclists and in order to have more father-son time together I learned to ride to be able to go in rides with him. 2. What made you decide to start racing your bike? I didn’t really decide, my dad simply entered me in a race one day, it was a hard day as I finished dead last. 3. What was the biggest challenge you face with your training? DISCIPLINE, as most physically competitive sports discipline is a big factor and has definitely been a challenge for me. There is a big commitment, it is a lifestyle almost; food consumption is different depending on the season, prepping for a race takes many tasks including something as simple as pre race hydration that starts days in advance. 4. What motivates you to train harder? Race results, seeing how your training makes a difference and in time you start catching up to competitors that left me behind from mile 1 and eventually overcoming the competition. One huge motivator is reaching the upgrade points requirements to move up in rider category. 5. What are your goals for 2018? The big goal; this years Cyclocross Season hopefully resulting in a Top 10 finish at Nationals in Louisville, KY.
6. Who’s helped train and encourage you along the way? Family, my Dad who’s my Trainer and Mechanic, Mom and sisters are definitely the phsicologists and cheerleaders. 7. 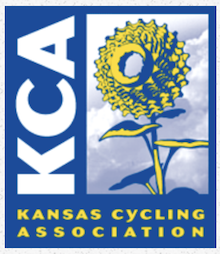 What is your favorite place to ride in Kansas? The backroads around Bucyrus, Stilwell, Spring Hill, and Olathe; minimal traffic lights and stops offer for long non stop riding where I can push training to almost race like level. 8. What is the best advice you have to help others train for races? Nutrition; the right foods, nutrients, carbs and calories are essential not only in performance but for recovery. 9. What is your favorite quote or tip to motivate others to keep riding? It seems weird, but the more miles you pedal the better and more fun cycling gets. 10. Where do you work/career field? Family? When off the Bike I concentrate on School, everyone in the family helps in diverse ways so that I can focus on School work and then Train/Race. 11. What is your most epic cycling adventure? 2018 January Cyclocross Nationals in Reno,NV; adrenaline rush like I had never experienced before.